(AD) We have been kindly gifted products from shopDisney, all thoughts and opinions are our own. There is no argument that Disney has the heart of households, adult or child we all have our favourite films and characters that bring us joy. It finds itself onto out TV sets, into our toy cupboards and more recently into our wardrobes. The perfect buys for your beautiful baby. Ensure your beloved baby looks as sweet as honey in the popular Winne the Pooh themed outfits, or why not buy the perfect gift for new arrivals including accessories such as bibs, blankets, plush teddies and toys that also feature the popular faces of Bambi, Dumbo, and more. The magic is in the details and shopDisney products have never let us down, they are always high quality, well sized and wear well. Unlike some other brands we found I like that the neck and sleeves are not too tight, items are machine washable, highly details and practical, often with popper fastenings and adjustable straps. Transform your nursery into the Hundred-Acre Wood! Disney Store Winnie the Pooh Baby Romper. A gorgeous all in one Norah could wear this for day or night. The footless bottoms mean little ones don’t overheat and older babies can use their feet to cruise around without worry of slipping. At £13.00 it is a very reasonable addition and the stretchy fit will last her well. The comfortable cotton-blend design features Pooh’s face detailing, 3D ears and tonal stripes. ShopDisney also sell some non-slip cute and comfortable Pooh themed baby slippers, the perfect partner to this romper. shopDisney Winnie the Pooh Baby Blanket. Suitable from birth, why not bring home the enchantment of Pooh with this gorgeously designed and beautifully sized blanket fleece feel featuring the immediately recognised embroidered character face with sweet little 3D ears. Retailing for £16.00 it will last your little one for years and create the perfect bedtime pair with lovable little Piglet. The ideal cuddle companion has a partial beanbag filling, made of soft fabric and what I love he is the perfect accurate reproduction. Your baby will be bound to fall in love. shopDisney Winnie the Pooh Baby Dress and Body Suit Set. Let the pictures speak for themselves with this gorgeous two-piece set which features a long-sleeved vest with all over character print, and a soft-feel dress with embroidered details and again those adorable 3D ears. One of the best features is the careful consideration given for baby’s comfort and movement, such as the elasticated panel at back and adjustable length straps. We matched the outfit with long length, cotton Winne the Pooh socks that are great as they don’t fall or get pulled off easily!! You may have noticed it was hard to get a photo of Norah in this outfit as she was so, so excited by the amazing (and very reasonably priced) Winnie the Pooh treehouse playset. A doddle to construct, and perfect for boys or girls explore the Hundred Acre Wood, racing, bouncing and sliding the Tigger car perfectly designed for little hands to grip. The set is made of very sturdy plastic and will hold up well to getting sat on by an exciting Norah, at £19.00 this would make an amazing gift for a baby 12+ months. shopDisney Winnie the Pooh Baby Dress and Tights Set. This Winnie the Pooh three-piece dress set is the perfect party piece for £24.00! Featuring a mesh overlay with gathered details, the skirt underlay has character artwork partnered adorable with ruffled cap sleeves. It also comes with a matching headband and pink bow design tights. This perfect pastel wear cheers up Pooh bear’s gloomy but wonderfully huggable friend Eeyore. From the new Christopher Robin film, I love the vintage look of this soft toy and the soft-feel donkey features a characterful expression with a fluffy mane and tail. Almost the same size as Norah. 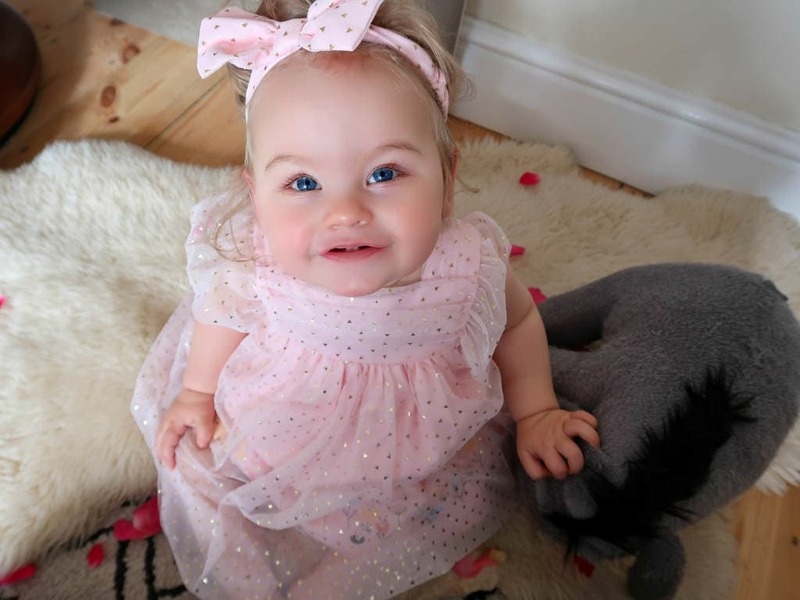 We have fallen in love with this gorgeous collection featuring our favourite characters featured across super soft Babygro’s, rompers, twin sets and so many more outfit choices. Our next collection in our wish list is the Mary Poppins set!